The news that the fire fighters union is “quietly helping“ the recall effort against Mayor Tom Barrett, as reported by Journal Sentinel columnist Dan Bice, would once have been a very big deal. It was not that long ago, after all, that the police and fire unions had tremendous clout with city officials. It was difficult for any city politician to get elected if they were opposed by the two unions, and a majority of Common Council members could be counted on to support collective bargaining agreements that were good to police and fire fighters. But that hasn’t been true for a decade or more. Nowadays the police and fire unions can get the support of only a couple Common Council members on key issues and have had trouble electing an alderman friendly to their cause even in a district where many of their members live. In the 2016 mayoral race, the fire fighters first endorsed then-alderman Joe Davis against Barrett, but Davis couldn’t even win the primary. Then the fire fighters joined the police union to back Ald. Bob Donovan, who got crushed by Barrett, who won 70 percent of the vote. Donovan couldn’t even carry his own district, where he won just 30 percent of the vote, and nearly lost his simultaneous bid for reelection as alderman. Donovan has been a bit less bumptious since then, and there is no sign he supports the Barrett recall. Indeed, when it was announced on July 7, the recall had not one notable person or group behind it, which would seem to doom its chances of getting more than 51,000 signatures in 60 days, much less of finding a viable candidate to oppose Barrett. The fact that the fire union is now involved (though its president Dave Seager declined to explicitly endorse the recall when asked by Bice) doesn’t change the odds for a recall all that much. It actually says far more about the union’s loss of power at City Hall than about any weakness of the mayor. The cost of police and fire fighters has changed dramatically because the city has gotten squeezed by the state since the mid-1990s, when state shared revenue paid the entire cost of Milwaukee’s police and fire departments, plus another $38 million for other costs, as I’ve reported. Since then, state shared revenue to Milwaukee has steadily dropped, in real dollars plummeting from $366 million in 1995 to $219 million today. During that same period the state biennial budget rose more than six-fold, from $11.2 billion to $72.7 billion. Personnel costs drive both the city and state budget, so the city has been mercilessly squeezed. In 2004, when Barrett started as mayor, the police and fire budget represented 62.7 percent of the city’s combined shared revenue and property tax levy; by 2017 the police and fire budget accounted for 87.7 percent. Increasingly, it’s become difficult for the city to pay for anything but police and fire services. Gov. Scott Walker’s signature law, Act 10, reduced benefits for government workers, except police and fire fighters, who happened to support his election, and who are a bigger part of Milwaukee’s budget than any governmental unit in the state. This has meant that everyone from the mayor to garbage workers to city librarians now contribute more to their pension, but not the police and fire workers. Today, police and fire workers account for 77 percent of all taxpayer contributions to city employee pensions. Meanwhile the police and fire unions have done everything possible to add to the city’s financial problems, doing end runs around the collective bargaining process and successfully lobbying for state laws that force the city to spend more money to give them special deals: for instance a law guaranteeing that police who were suspended could continue to collect pay while they fought the suspension in court. But the biggest gift to the unions was the law ending the residency requirement for city workers. The unions had been offered the option of taking a reduced wage and benefit package from the city in return for ending residency, and declined. They used the collective bargaining process to give them the best retirement package of any employees in the state, allowing cops to retire as early as age 43 and fire workers as early as age 49. Then they circumvented the process and got Walker and Republican legislators to end the residency requirement. Police and fire workers often grumble about city property taxes, which are higher than many surrounding suburbs. But the major, nay overwhelming reason for the level of taxes is the wages and benefits they are paid. Now they needn’t live in the city and help contribute to the tax base that has so generously rewarded them. City records show that 214 of 712 fire fighters — 30 percent of the city’s entire force — now live outside the city. (Just over 27 percent of police officers have moved out of the city.) In short, nearly a third of the fire fighters aren’t even eligible to sign the recall petition. So I wouldn’t expect the fire fighters help to have a great impact on the recall effort. Mostly they are simply proving how willing they are to repeatedly bite the hand that feeds them. And then they wonder why most city politicians have a negative view of them. The issues put forth by the largely anonymous backers of the recall are crime, the streetcar, and the need to replace lead laterals in older residences in the city. All were raised in 2016 and Barrett still won overwhelmingly, which suggests there will not be a groundswell of volunteers circulating petitions. Which means someone would have to pay for people to circulate petitions. Will the fire fighters union? Seager isn’t saying. Another potential funder, some have suggested, is developer Frank Crivello, who has contributed heavily to local politicians in recent elections. There’s also speculation that the Republican PR operative Craig Peterson might funnel money to the effort but he emphatically denies this. “The folks involved in the recall are people I know,” he notes, “so I may have made introductions between them.” But he hasn’t offered to provide any money for the effort, “not a cent,” he says. 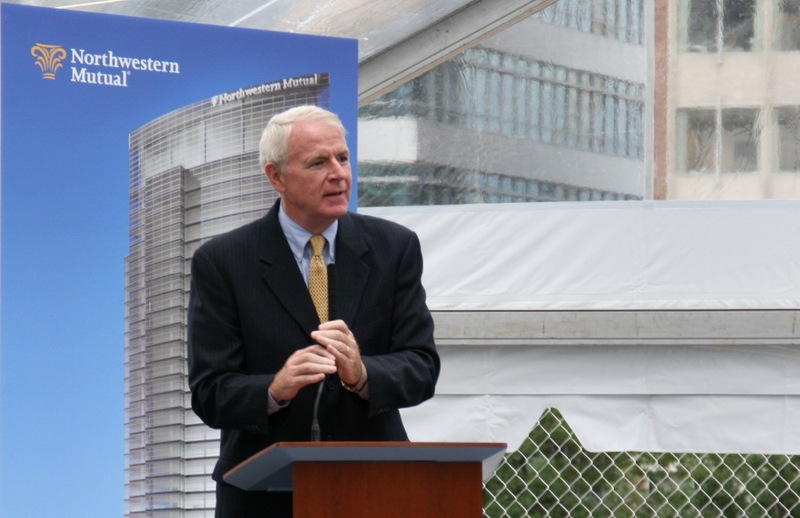 I would consider myself “liberal” and I think Mayor Barrett is a joke and a typical big business status quo Democrat. And I would be careful to categorize the people who support recalling the mayor. People like you who spin articles in one direction are pathetic, never mind just as responsible for partisan slanted opinion-based writing. Fact – police and fire were told by the city if you want residency get it legislated because you will NEVER get it from us. So they did. Fact – every contract we sign ends the year we sign it so we are almost always working without a contract and therefore at the bargaining table. Fact – you want people to live in the city, make the city a place people want to live by addressing the issues the city has not blaming them on two entities. Fact – the job of police and fire takes a toll people like you could not handle and therefore we able to retire earlier, never mind the host of mental health issues and medical problems we are statistically more prone too. But the biggest fact you so casually avoid, and it’s obvious why you avoid it is that the biggest chunk of the city’s budget is not police and fire, it’s the teachers. But because they are their own taxing authority you leave them conveniently out of the budget picture as if they are all paid for with unicorn tears and fairy dust. Why people like you write incendiary garbage rather than just stating ALL THE FACTS OF BOTH SIDES OF AN ISSUE is beyond me. As a moderate liberal I condemn your blatant partisan babbling, even though you state correctly the issue of shared revenue which is a huge culprit for our woes, it is the actions of a do-nothing mayor who thinks vacant lot parks, flowers and a street car will change the direction for the poor and disadvantaged of our city rather than jobs. Why should he be careful? Speaking of blatant partisan babbling. Doesn’t matter how you label yourself. If you think that’s partisan babbling, well your an idiot. Never mind after all that, paraphrased the least important point made. Very telling. The police officers and firefighters do pay into their pension. With these comments on your opinion piece pointing out how wrong you are I wonder if anything in this piece is correct. I never thought about community policing in any sort of economic terms. This article made me also economic and political advantages community policing might provide. Maybe community policing could help mitigate the enormous impact MPD has on Milwaukee’s budget. (I won’t even get into the fact that what really nauseates most is that these two unions have no qualms about supporting Walker at other workers and taxpayers expense. As to MPS and the teachers contributing to the local property tax, that’s true, as do the budgets of the county, MMSD and MATC, but this is a story about the city and the proposed recall of the mayor. Those fire and police need to pay a huge increase in their pension costs since they became Hessians. Barrett has offered a city with few job and loads of violent crime. He spends his time and effort on the 10% who live in the East Side/Downtown bubble. The liberal thinkers and liberal writers. They are of the correct political lean. The rest of the city gets little, and now even the police and fire are being eliminated. Hey, we got downtown condos and a trolley though. Bruce I don’t know what you did to stir up the Barrett hating trolls, but the firefighters union history is actually even more interesting. After years of open conservatism, in the 2000s they elect their first black leader in an organization that actually had a number of black firefighters (I lunched with them). Bobbi Weber was actually a tough negotiator with the city but he also helped the union rejoin the labor council to get solidarity support . In 2010 if I remember he was dumped in favor of a virulent Seager who left the labor council and made sure to twist toward Walker, which frankly many of the conservative fire fighters who want to live on lakefront property wanted. One, the state sets limits on how much MPS can raise in taxes and spend; the city has no such limit. As a result, even before Act 10, there were significant constraints on what MPS and MTEA could be expected to work out in bargaining; police and fire unions have never faced that kind of pressure. Indeed, for well over a decade, MTEA bargained under the threat of the QEO law, which allowed MPS to unilaterally settle a contract dispute by offering a pittance in increased compensation, and a state law against striking which limited our leverage against MPS. Two, as Bruce noted, state support for the city has fallen dramatically since Walker’s ascendance in 2011. The same is true, to be sure, of MPS (and all 400+ other districts in the state). But in the case of MPS, the cuts were paid for by me and my colleagues in the form of smaller take-home pay–thousands of dollars annually for individuals and tens of millions for the district’s workers as a whole. While we’ve negotiated some improvement in pay, veteran teachers are still thousands behind where they might have expected to be at this time. I know I am. Three, despite cuts in state aid to MPS, the majority of MPS’s revenue still comes not directly from the local levy, but from the state. The relative burden of this city’s teachers on city taxpayers is significantly smaller than it is for police and fire. Four, police and fire unions and their support for Walker and his agenda should at least be willing to admit their role in creating the current budget crisis in the city where, as Bruce explained, almost 9 of every 10 tax dollars collected from local taxpayers *and* from state aid goes to police and fire. MTEA and its members have strongly opposed Walker and the GOP’s decimation of state aid. We were at the budget hearing at State Fair Park this spring; where were you? Milwaukee has huge problems not being solved and this is what prevents them from getting more help from the state. The downtown and east side, SWEst and SEast sides are all good but the rest is disaster. it is not safe to go in many [arts and that si branching. The crime wave is worse than Chicago, kids cannot read. MPS a National Disgrace. Abandon Homes, bad roads, human trafficking, unchecked drugs on street corners, prostitution, 57% kid unemployment yet they want $15.hr wages,, heroin epidemic, top ten wosrt run, corruption, Milwaukee county govt a state disgrace. Out state thinks of Milwaukee as a giant pit. WCD what does any of that drivel have to do with the firefighter’s union backing the nonsense recall? How is this a justifiable recall when the Walker one was not? Sorry Jay, normally I am actually on your side. Teachers have a thankless job in this city and I referenced your economic impact only because this piece of literary dribble chose, like most who pander to a side, to explain all the facts instead of only the ones that champion their cause, however per the 2016 tax assessment on the city assessors page the city assesses 10.75 per $1000 of value and MPS assesses 11.5, so, as I stated before your entity costs more than both police and fire combined. But guess what, you should, like us you are vital to the strength and future of this city. That does not mean you and yours are not a hugely expensive part of this cities budget. You see WCD at the top of a comment and you know it will be the same idiotic nonsense posts that he puts up dozens of times. I thought I posted this but sure clarifies Jay on teacher issue. Glad the MPS limits were brought in. I have written several stories that the city property tax bill, if accurate and changed its green dollar bill to match the yellow insert that few read, would reflect that the city is the largest cost of such taxes not MPS as listed since the 50 million plus that goes to voucher schools is included by state law as an MPS expense though it never sees a penny. And fire and police are the largest part of that city bill. Geesh, Bruce. LObbyists are by nature selfish. They exist solely to promote their own interests. Can anyone explain the recall end-game? I mean, there’s a zero percent chance it will succeed. The mayor knows it, the recall petitioners know it, everyone knows it. So what’s the benefit of a failed recall attempt? To make Barrett look strong? Perhaps when it fails WCD will acknowledge that Milwaukee is not a giant pit. To Duncan: I can’t prove what the end game might be (though I have suspicions), but the anonymity of the supporters (I regularly get emails from an anonymous source updating me on it) suggests, at least so far, that this is not a grass roots uprising. Until they achieved their holy grail, the end of residency rules, the police and fire unions basically served as the political voice of the old-time white voters on the edges of the city, who can no longer elect their kind of mayor (as proven by Greg Gracz and Bob Donovan). Now they have strictly become carcass feeders. Re post # 25, I see no grass roots in this recall effort. It more closely resembles the nihilistic “toss the bums out” rhetoric of right wing talk radio – pointless vitriol that results in the elections of the likes of Walker and Trump. Our Bayview … and he is working at making troubled neighborhoods better. Who remembers when Hillside was a dangerous project or what First Hill looked like twenty years ago? I WANT to “Back the Badge” and I always greet and thank our Police and Emergency persons, but how is living out of the city and supporting Walker “backing” me? Is there any example of eliminating Residency requirements in a major (or even minor) city improving safety, economic well-being, or community relations? Baltimore and Detroit don’t look too hot. As an MPS teacher (now retired and on a very minimal pension) I always argued for residency tho many teachers resented it. Yes the work of Teachers, Police, and Emergency people is highly stressful. Yes , we deserve decent support and compensation. But I have lived IN the city, even when not working here, schooled my kids in MPS (they’re doing great! ), and really resent those who have moved out. Further, during my entire 30 year career, I remember only continuous reductions in state funding for our urban centers. Our city cannot afford pensions for workers who leave us in the lurch! The recall is absurd, given the election result. The City of Milwaukee is horribly limited by economic hardship. Crime is not just a Milwaukee problem, its a rural problem too. As a chemist I can tell you that lead pipes and paint are a statewide and very difficult problem to solve and require careful technical management (horribly lacking in Flint) , not hysterical politicizing. Lets recognize that the problems we face are monetary and are callously forced on us from the outside. Law enforcement, schools, emergency preparedness and services have been de-funded for decades. Reckless finger pointing doesn’t contribute anything to the solutions. I salute every city worker who stays committed to the community in which they serve, making stronger neighborhoods and better schools! No one can just wave their hand and make this a better place to live (a snide Walker retort). Lets go “ALL IN” for Milwaukee. Things will continue to slide if we don’t. Great comment Steve, Unlike the ideologues who show up here and elsewhere, you nailed it right on the head. Thanks to the economy, crime is coming out to the rural areas, indicating that it is not just a “cultural” (read – African-America) problem.